Cape Town, the lively port city on South Africa’s southwest coast, lies beneath the imposing Table Mountain. Offering a merry mélange of colonial flavours in a modern metropolis, it has much to offer. 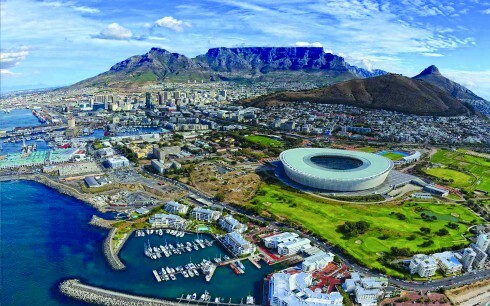 The best times to visit Cape Town are from March to May and from September to November. June, July August are considered winter months here, and hence one can expect chilly weather and frequent rainfall. Cape Town has a long and rich history. No wonder that one can see a multitude of iconic buildings all around this vibrant city. One just cannot miss the colonial feel and what is most heartening is that many of these old and ancient structures are still used today. 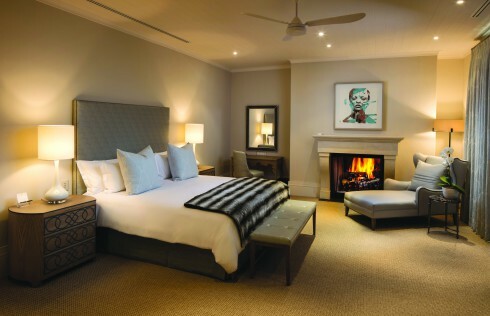 Leeu Estates is an exclusive five-star boutique hotel property located in Franschhoek Valley, in Western Cape Town. A short drive from the hustle of the city leads to this oasis which lies in the middle of a working wine farm. However, The Manor house, a beautifully refurbished 19th century structure is a self-contained unit within the estate that comprises of six luxuriously appointed rooms and suites. Every design element of the Manor house exudes opulence and refined taste. The rooms are very spacious and lavishly furnished. Warm brown tones dominate the colour palette. The addition of fireplaces adds to the old world charm. The most striking element is the wonderful and well curated art collection that pervades the entire hotel. Not only the public spaces but also the rooms are a treasure trove of wonderful modern African art. 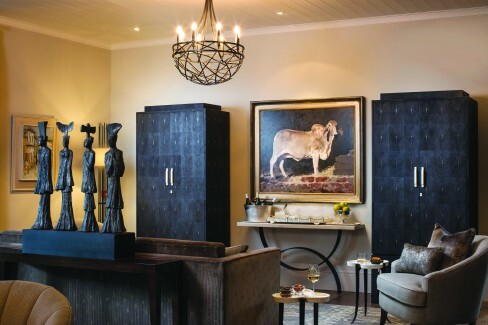 The European colonial style of the house along with the tasteful contemporary art creates a very unique setting to soak in natural beauty as well as the magic of good design. 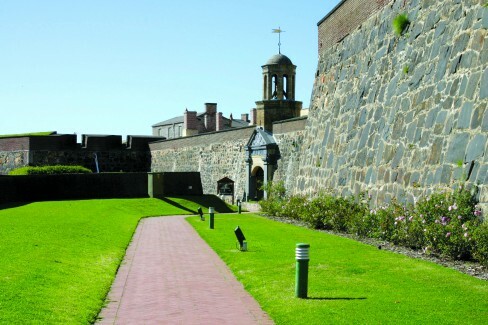 The Castle of Good Hope, a bastion fort, stands amidst the bustling modern city of Cape Town not only as a remnant of the past, but also continuing to function as the oldest working office in the country! It is witness to the emergence of Cape Town as a modern metropolis. The fort is considered the best preserved example of a Dutch East India Company fort. 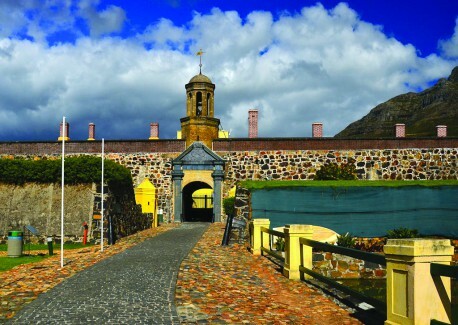 It has been the centre of civilian, political and military life at the Cape from approximately 1679. Architecturally, the castle is built like a fortress, since that was one of its primary uses. It offers panoramic views of the surrounding ‘battlefield’ from within the thick stone walls. However, in the past, it housed a small community or town all on its own! The sea is an integral part of the city’s history, woven intrinsically within it. 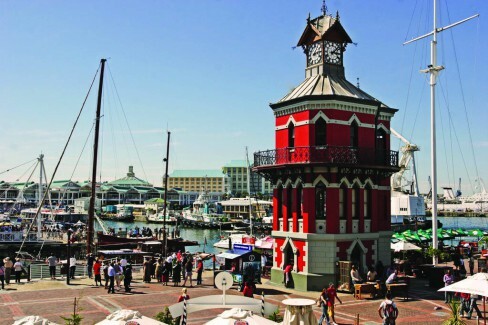 The Clock Tower in the V&A Waterfront of Cape Town is a great historical landmark. What makes this building conspicuous is that it is surrounded by a commercial harbour, a huge entertainment venue with restaurants, specialty shops, craft markets and theatres. The contrast with these modern structures makes it stand out, as does its bright red colour. It is built in the Victorian Gothic-style. One can walk into the tower and look at the old tidal-gauge mechanism on the bottom floor, which was used to check tide levels. On the second floor there is a decorative mirror room, which enabled the port captain a full view of all harbour activities. The clock mechanism can be found on the top floor and thanks to the restoration of this national monument in 1997, the original clock is still in use today. When you alight at the Cape Town airport, there is a small display of colourful buildings. 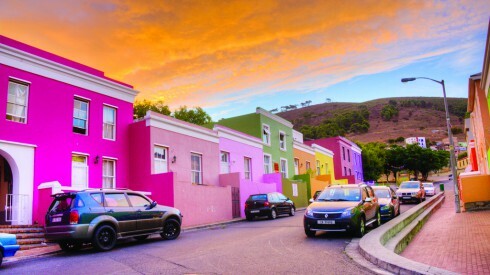 Little does a first time visitor know that this is a teaser and you get to see the real picture in Bo Kaap, clearly one of the most photographed areas of the city! Brightly painted houses and quaint cobbled streets is what characterises this very distinctive area, that also boasts of rich history and culture in its own right. 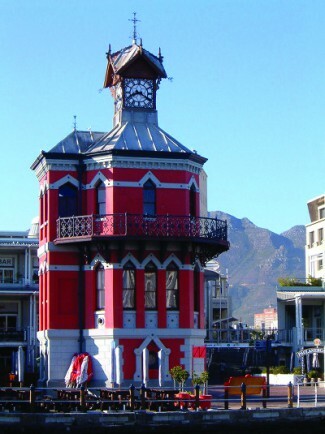 It is one of the oldest residential areas of Cape Town and the houses are a mix of Cape Dutch and Cape Georgian architectural styles. For those inclined to observe architecture, the area also hosts a museum which is actually one of the oldest buildings in the area, built in 1768, and still in its original form. The country’s oldest mosque, the Auwal Mosque is also situated here.